Map Update: Syrian Democratic Forces Make Fresh Gainst In Battle Against ISIS In Euphrates Valley 5.25 out of 5 based on 4 ratings. 4 user reviews. The Syrian Democratic Forces (SDF), supported by the US-led coalition, have made fresh gainst in their battle against ISIS in the Euphrates Valley. According to reprots, the SDF has captured the Shajilah area and entered the area of Huwayjat al-Khanafirah. ISIS controls a very small area on the bank of the Euphrates. However, the terrorists are still resisting to the advancing SDF forces. According to pro-Kurdish sources, the ISIS defense is about to collapse and thus the ISIS-held pocket will be fully eliminated. Very good even some more might be contested. Hard times for everybody. Its kind of strange sitting here with open window and hardly a sound. I can see the neighbors are cooking and their children looking at TV. Earlier today, they stated that the area left is 2 m2 but it will take them a couple of days to conquer !!! !, they are still going on now, so let us hope for a quicker solution. PS Await the return of the ISIS vermin phoenix popping up somewhere else – 15,000 well fed, well armed scum. All these ISIS scum need to be eliminated. But on more real news, HEZBOLLAH TAUNTS ZIONIST LOSER MILITARY WITH NEW HEBREW SIGNS. 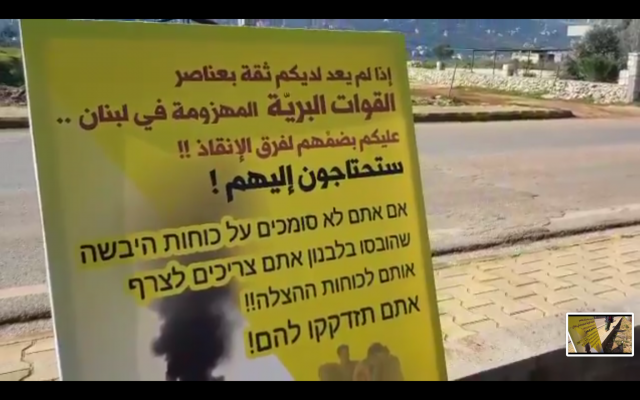 The signs are popping up all along Lebanese border with Occupied Palestine basically say that the Zionist are scared child killers, cry babies and will need diapers if they tangle with Hezbollah again. Most of ISIS are deep below. Why dont You get it. Its also filled with civilians. Dont You get it. Clear out the civilians and use MOAB. Thats the whole point. They cant clear the civilians in that mix. Haha. It might be impossible. I think they have digged as rabbits and foxes. Maybee anastesia, so we just could go down there and put them up in good and bad ones. So your advocating the use of chemical weapons?? Bad NATO shill vvery very bad!! Haha. All will wake up again and the bad ones handcuffed. Whats Your solution – cupcakes – cigars – wine ? Not really, they are dead end losers who are cornered like rats and no place to go. There are about 800 foreign ISIS scum left in the pocket and they have no chance. The mother of all bombs should be dropped on them, but the cowards are hiding behind women and children.. I am sure SDFs never will fight together with SAA unless SAA is under their command. I’ve been hearing these headlines all summer, winter and will they last into Spring. The SDF is advancing against the last 50 sq ft. of ISIS held territory. Are they gaslighting us? Maybee You should take some opium and calm down. I has been haha since SDFs should take Raqqa. Look at what they have taken – and from hardly nothing. And You we all see, they take their time. They are not first class soldiers exelant planners like You. According to Al-Masdar News no advancement by SDF have taken place despite many outlets including the local ones and social media ones reporting SDF gains lol! This despite the fact that they rely on Twitter reports and have no on-the-ground presence in the area. their r gains what males u think they r not?u out there? Al-Masdar claimed there were no gains, not me. I was only making fun of Al-Masdar because even local sources have reported gains. Agreements are in deeper gainst.Give more feed back on agreements. Good thing the SDF keeps feeding SouthFront fake news or else they would have nothing to report on. These stories are really just anti – Turkish propaganda, ISIS remnants are surrendering to the Kurds because their in the same situation, which is abandoned by the US, they say al- Joulani is now not affiliated with al-Qaeda they too might be in the same boat. The point I’m making is that all these rebels could square the hole by supporting Turkey. Turkey is supporting Iraq by maintaining bases in that country why not Syria, ? Then we can all be one big happy family as the US pulls out to fight another day, if you can call what the US do is fighting.